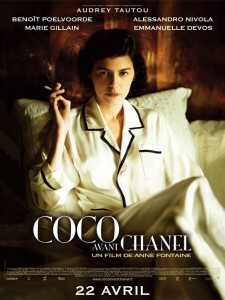 Coco Avant Chanel, Anne Fontaine’s gorgeous film about the early years of famed Fashion Designer Coco Chanel charts an unusual course as biographical films go. There are no famous people, struggles with addictions, few tragic events and none such biographical directions that films in a similar genre like Capote and Pollock take. While Capote and Pollock showed how those respective artists gained famed and notoriety, both succumbing to the excesses of creativity, Coco Avant Chanel portrays a strong personality, a woman who was way ahead of her time in terms of vision and conception. She was the French version of Queen Elizabeth I, beholden to no one except her own ideals and determination and while she wasn’t royalty, Coco Chanel’s enormous influence on style and design can still be seen a century later. Dismissing the frivolous fashions of the early 20th century when French fashions were limited to the silky and often too feminine designed of court designer Charles Frederick Worth – Chanel aspired towards simplicity in a masculine world which sought to minimise women’s power and their ability to succeed. What made Chanel an international brand was the 1920s and 1930’s when due to the depression and post World War I economic restrictions placed in Europe made simplicity and practicality key not to mention stylish and more affordable. Gone were the big hats with feathers, strings of pearls and corsets, Chanel changed women’s fashions and their perceptions forever. Stylish even in her Sleepwear….